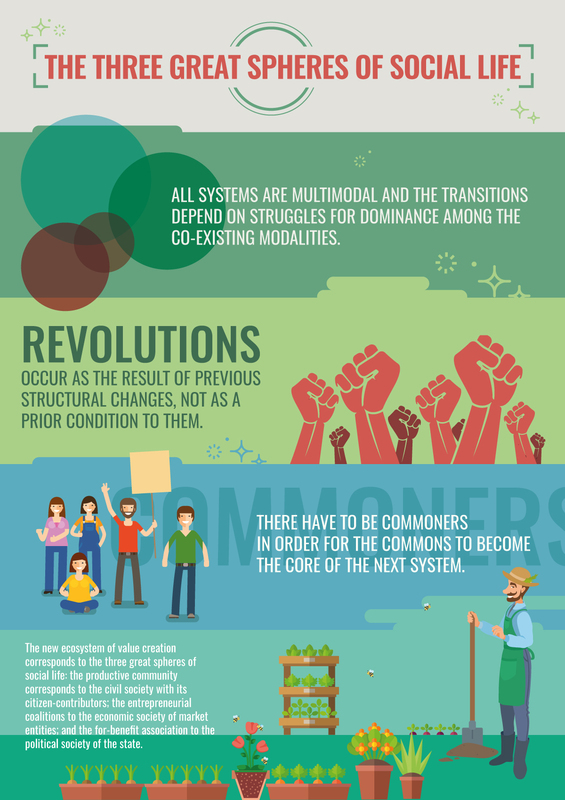 Today, we’re happy to share with you our recently completed project, the Commons Transition Primer website, with new and adapted texts by P2P Foundation members (including its founder, Michel Bauwens and our colleagues in the P2P Lab). Featuring specially commissioned illustrations and infographics, this Primer emphasizes the value of P2P and Commons approaches to work, politics, economy, environment and culture. We’ve built some other useful features into this site, too. In the Short articles, Key Concept pop-ups offer definitions of specialized terminology. Case Studies outline the practices of existing commons communities, often adapted from our own research publications. Infographics and illustrations have sections of their own, for easy sharing. To keep things light, we’ve added a tab with a “TLDR” summary (internet slang for “too long/didn’t read”, if you didn’t already know), plus a tab for Resources which links to source and reference materials for the specific article. This website was produced with the support of the Heinrich Böll Foundation, and is an outgrowth of our previous Commons Transition and P2P Primer in print form, which was co-authored with Michel Bauwens and Vasilis Kostakis and produced in cooperation with the Transnational Institute (TNI). It will be followed in 2018 by a publication from Westminster Press titled Peer to Peer: The Commons Manifesto and written by Michel Bauwens, Vasilis Kostakis and Alex Pazaitis. We’d like to thank Heike Loeschmann, Joanna Barelkowska and Joerg Haas of the Böll Foundation for their consistent support and feedback during the process. The Commons Transition Primer website project was coordinated, edited and/or co-written by Stacco Troncoso and Ann Marie Utratel (except where other authorship is noted). Elena Martínez Vicente led the design and UX, Mercè Moreno Tarrés provided the illustrations while Javier Arturo Rodriguez took care of the technical details and backend. Thanks are due to David Bollier, Vasilis Kostakis and Rajesh Makwana for reviewing the texts in the “Shorts” section. Special thanks are also due for the technical expertise and last-minute interventions of our colleague, Lisha Sterling. Previous Previous post: Can the Commons offer a renewed vision for Europe?